Dave Taylor was drafted in the 15th Round of the 1975 NHL Amateur Draft, 210th overall, by the Los Angeles Kings. After a decent rookie season in which he scored 43 points in 64 games (which was probably more than what was expected out of a 15th Rounder), he was put on a line with center Marcel Dionne and left winger Charlie Simmer. The trio formed the famous “Triple Crown Line” and would quickly find great chemistry with one another. Taylor’s role on the line was that of set-up man. After the line was established in the latter half of the 1978-79 season, Dionne would finish the season with a career-high 59 goals. It marked the first of five consecutive 100+ point seasons. Simmer’s offense really sparked while playing with Taylor. Prior to the formation of the “Triple Crown Line,” his highest single-season goal total was 8, as he had never spent a full season in the NHL since he was drafted in 1974. Splitting time in the NHL and CHL, and later the AHL, Simmer reaped the benefits of Taylor’s selfless play. Charlie would score 56 goals in each of the first two full seasons with his new linemates, exceeding 100 points in both years as well. After five seasons, he had finally found his place in the league. Dave’s highest offensive output came in 1980-81 (his second full season playing on the TCL). He notched 47 goals and 112 points, which stood as personal bests for his career. He was selected to the NHL Second All-Star Team for his performance. That season would also mark the first of four All-Star Games he played in. In 1985 he was named team captain of the Kings and would reign until Wayne Gretzky’s arrival in 1989. His best chance at winning Lord Stanley’s Cup came in 1993, when L.A. reached the Cup Finals, only to lose to the Montreal Canadiens in five games. He would retire at age 38 following the 1993-94 campaign. In 1,111 career games he scored 431 goals, 638 assists, and 1,069 points. He ranks third all-time in Los Angeles for goals, assists, and points. However, he ranks first in franchise games played and plus-minus (+181). Despite his offensive production, he also ranks second only to Marty McSorley in penalty minutes (1,589). Following his retirement, he was made general manager of the Kings in 1997. He would hold the position until the end of the 2005-06 season (he finished his tenure 290-261-74-31, making him the winningest GM in franchise history). Taylor is currently the Vice President of Hockey Operations for the St. Louis Blues. His number eighteen jersey has been retired by the Kings organization. Defenseman Serge Savard entered the NHL at age 21, playing his first full season in 1967-68 at age 22. Despite scoring just 15 points in 67 games his rookie year, he increased that total to 31 in each of the next two seasons. Serge was able to feel what success was like from the very beginning. The Habs won back-to-back Stanley Cups in his rookie and sophomore seasons, with Savard scoring 10 points in 14 playoff games in the latter, earning himself the Conn Smythe Trophy as playoff MVP. After missing the end of the 1969-70 campaign and much of the 1970-71 and 1971-72 seasons due to a fractured, and (later) re-fractured leg, he returned in 1972-73 playing in a then-career-high 74 games, scoring a then-personal-best 32 assists and 39 points. The same year of his return to full health saw Montreal win another Stanley Cup. In that post-season, Savard scored a career-high 11 points in 17 games. After finishing the 1973-74 season with his worst offensive output since his rookie year, he made up for it the following season by scoring a career-high 20 goals, 40 assists, and 60 points in a career-high 80 games. He also set a personal best with his +71 rating (career-high: +79 in 1976-77). From 1976 to 1979, Savard and the Canadiens won four consecutive Cups. For those of you keeping count at home, that’s numbers four, five, six, and seven for Serge. 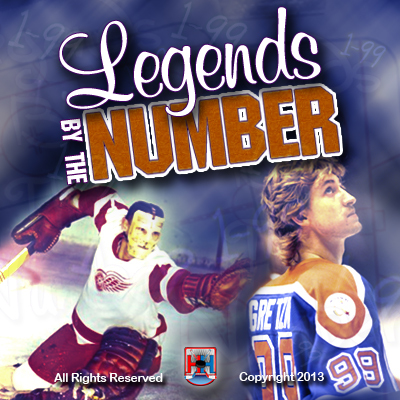 In 1979 he was awarded the Bill Masterton Trophy for perseverance and dedication to hockey. Over the course of his career, he became known for performing the “Savardian Spin-O-Rama,” which would be used often by #1 on this list. Savard was a member of the 1972 Canadian team that defeated the Soviet Union in the Summit Series. He retired at the age of 37, following the 1982-83 season. Like Dave Taylor (see above), Serge would also become a general manager. He would receive two more Cup rings in 1986 and 1993, this time in the front office. He was responsible for drafting goaltender Patrick Roy in 1984. Savard was inducted into the Hall of Fame in 1986, and his number eighteen jersey has been retired by the Canadiens organization (in 2006). What’s this? A second Savard on this list? Is that a typo? Not only is it not a typo, but Denis and Serge are not even related. Not related you say? But they wore the exact same number, they both played for Montreal, and they were both known for performing the “Savardian Spin-O-Rama.” The two Savards have some eerily similar characteristics, but no, not related. Denis was drafted third overall in the 1980 NHL Draft, and made his professional debut in the same season as Serge’s last year with the Habs. At age 19 he scored 75 points in 76 games. The next two seasons he would score 119 and 121 points respectively. He would record 100+ points in three more seasons as well. His most impressive statistical season came in 1987-88, when he scored 44 goals and 131 points. From 1980-81 to 1991-92, he would score 20+ goals and 30+ assists in each season. In 1982, 1983, and 1985, Savard and the Blackhawks would reach the Conference Finals, but were unable to reach the Stanley Cup Finals. In the 1985 post-season, Savard scored 29 points in 15 games. In 1989 and 1990, Chicago would also reach the Conference Finals, with Savard scoring 19 and 22 points respectively. The latter of those two seasons would be his last in Chicago. In the summer that followed, Savard was dealt to the Montreal Canadiens for Chris Chelios and a second round pick in the following year’s draft. In his third season in Montreal, he would finally win a Cup in 1993 at age 31. After spending a year in Tampa Bay, he was traded during the following season back to Chicago in 1995. In the 1995, Chicago reached the Conference Finals with Savard leading his team in post-season points with 18 in 16 games. He would finish his career with 175 points in 169 playoff games. He would retire following the 1996-97 season, having accumulated 473 goals and 1338 points in 1196 games. He was elected into the Hall of Fame in his first year of eligibility, 2000. His number eighteen jersey was retired in 1998 by the Blackhawks organization.